Big fish Audio präsentiert in Zusammenarbeit mit YNK Audio eine massive Construction Kit Library – 50 Tracks im Style von Young Money, 'Lil John, Drake, Jay-Z , T.I. und viele mehr: Krunk Kingz! Each Construction kit not only includes the breakouts of all the individual loops but also includes a full set of drum trax and individual drum hits for endless custom beat options. 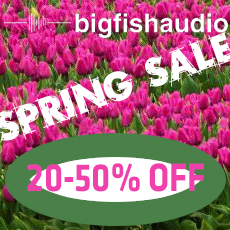 These high-quality 24-bit samples are radio ready and come in Acidized WAV, Apple Loops, REX, Kontakt (KLI Series), MIDI, and FL Studio formats. These kits are jam-packed with the punchy drums, big synths and deep subs you need to top the charts. Krunk Kingz also includes Drum Kit and Drum Menu patches. The Drum Kit patches include all drum loops and single hits from a particular construction kit. The Drum Menu patches include all the one shot samples of a particular piece of the kit, e.g. claps, kicks, snares, hi-hats etc.